Director: Mats Stenberg / Writers: Thomas Moldestad, Martin Sundland, Roar Uthaug, Axel Hellstenius, Marius Vibe / Cast: Ingrid Bolso Berdad, Marthe Snorresdotter Rovik, Kim Arne Hagen, Fridtjov Saheim, Per Schaaning, Johanna Morck, Mats Eldoen, Andreas Cappelen, Robert Follin. 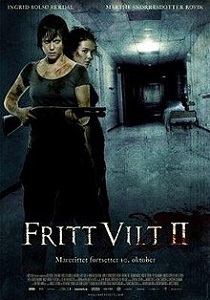 In terms of creating a sequel that picks up immediately after the events of the first film, Cold Prey II gets a big fat tick for getting it right. While on the surface it will appear as little more than a Halloween II rip off, the continuity in play stomps that film to dust, as does the ratcheted up tension, equalling the first film when it comes to edge of your seat fear for people walking around the dark, empty corridors of a clinic. A day or so after surviving the attack of the hulking Fjellmannen, Jannicke is rescued by a patrol car after her group’s car is reported as being seen abandoned in the mountains. She wakes up later in the soon-to-be-closed clinic in town, police and staff at the foot of her bed anxious to know what happened. While she recovers, the cops locate the crevasse where the bodies were dumped and repatriate them to the morgue. Meanwhile, the skeleton staff at the clinic are preparing to move on to new lives: Future doctor Camilla is struggling with the desires of her boyfriend, Ole, and fighting off the flirtation of Herman, the remaining doc, and nurse Audhild wants to party and perhaps get it on with rookie cop Svarre, who’s stationed at the clinic while the others investigate the ski lodge of death. Jannicke asks if she can see her friends, resulting in the sad scene where she gets to say goodbye, with all the previous actors returning to play their dead selves, but the fifth body bag that contains their killer is also there and later, when being prepped for embalming, it appears he’s not so dead after all and the medics stick by their oath and resuscitate. Of course, you can never keep a slasher movie killer down, and he’s soon up and slashing, bludgeoning, and breaking the necks of anybody unlucky enough to cross his path. Jannicke is soon engaged in another game of hide and seek, trying to save pre-teen Daniel from being pick-axed, while the police chief tries to learn the truth behind the identity of the Fjellmannan. Despite Jannicke’s protests, nobody listens and people keep going into the clinic to try and shoot him, until he gets away and heads back to the lodge for the final scrap. Cold Prey II is, to the original, as Aliens is to Alien - the budget has been cranked and with it the action and special effects inserts. Jannicke’s yearn to survive has been traded with a thirst for violent revenge, and she’s thrown around, through glass tables and into walls a lot more than the first time. She also shares some of the final girl duties with Camilla, who supplies the running and hiding side of affairs early on – though I think in the interests of the film’s emotional punch, she should’ve been made another victim. Ooh, harsh. An amazing accomplishment for a sequel of any stature, it really is a continuation rather than a retread, addressing lots of those ‘well, what happened next?’ questions that crop up: We see the cops/rescue squad photographing and cataloguing the victims, the beginning of the official investigation, and Jannicke’s gradual ‘comedown’ – it’s just all thwarted by the reactivation of the killer. Things also end properly and very finally, with Cold Prey III sensibly opting to go back to days of olde and act as the origin tale. I kinda considered the killer’s ressurection scene here as one of the best from this sub-genre: simple, yet crazily erratic with all of that thrashing and shaking.